Japanese chef knives are some of the best knives available in the world. A lot of skill and mastery goes into the manufacturing of knives in Japan. What you may not know as a Western cook who is just looking into the world of Japanese cutlery, is that there are many types and styles of Japanese knives. The variations make it difficult for a newbie to choose the best Japanese chef knives for their own kitchen. Being a frequent traveler, and having visited Japan myself, I know that a lot of people who visit Japan put finding and buying top-quality Japanese kitchen knives at the top of their list of things to do while there. Of course, there are a number of shops in tourist areas of Japan, including Tokyo, Kyoto and Osaka, where you’ll find a huge assortment of Japanese kitchen knives just waiting to be taken home with you, but if you don’t go into the experience with at least a little knowledge about what to look for when purchasing a Japanese chef knife, you have a high probability of walking away with the wrong one for you. We’ve put together a list of important criteria to look for when you choose the best Japanese chef knife. Once you’ve read through this list, you’ll be more familiar with the types of Japanese kitchen knives that are available and you’ll be primed and ready to purchase one that suits you. Keep in mind when looking for a knife that not all of them are created equal. To be blunt, a lot of knives that are called “Japanese” knives are actually manufactured in China, using the same method as a Japanese knife. There is a difference. If you’re looking for the highest quality, top of the line materials and construction, you should make sure the knife is manufactured in Japan. The knives in the chart below are all manufactured in Japanese and are some of the best knives you can easily purchase without traveling there yourself. However, that doesn’t mean knives that are manufactured in China are bad. If you can’t afford an expensive Japanese knife, these lower-cost knives can be a great way to try a Japanese style knife and see how you like them. Below, you’ll find 4 options of Japanese-style knives that don’t have the hefty price tag of the high-end Japanese knives, but are still very good, high-quality knives. If you don’t have time to read all of the reviews in order to make a decision, this comparison chart should make it easy for you to quickly see the knife options and their main features. First off, let’s clear up one thing that will quickly narrow down the field of choices. I mentioned before that there are many different styles of Japanese knives, but the one you will likely use most frequently is a gyuto. Gyoto is the basic equivalent of a Western chef’s knife. They generally range from 210mm to 270mm in length, though you’ll find some that are shorter and longer. They have a very similar style to what you’re probably used to in a chef’s knife. Unless you’re specifically looking for a sushi knife or a fish knife, it’s a gyuto you’ll be looking for. I personally like a smaller knife blade, somewhere around a 180mm is equivalent to a Western utility knife. Read this guide on cheftalk.com to learn more specifics about Japanese knives. If you’ve already decided to purchase a Japanese chef knife, you likely already know the differences between Western and Japanese knives, but for those who don’t, we’ll quickly go over it. Japanese knife makers have a tough task. They produce knives for chefs who spend their lives perfecting one specialized craft, which usually requires expert knife skills and great precision. Without the perfect knife, they wouldn’t be able to reach the level of mastery they do. For this reason, Japanese knives are quite a bit different than Western knifes. However, many Japanese knife brands have begun to build Western-style knives for Western chefs, so you need to be aware of the differences or you may end up with a Western-style knife made by a Japanese manufacturer. Read more about German knives and how they differ from Japanese knives. One of the main differences between Western and Japanese knives is hardness. Japanese knives are harder, which gives them a few advantages over softer knives. The harder the steel, the more narrow of an edge it can sustain, thus Japanese knives typically have a 15 (or less)-degree angle, rather than a 20-degree angle. The hardness also allows the knife to hold a sharp edge longer. The softer blade of a Western knife has a tendency to bend or fold over slightly with use, requiring more frequent honing and sharpening. Needing to sharpen the knife more often will eventually lead to shorter life span for your knives. It’s ideal to use a whetstone to sharpen Japanese knives, but there are a few electric knife sharpeners that are made for Asian knives. However, hardness can also be a con for the Japanese knives, because it causes them to be more brittle. Dropping the knife could lead to significant damage and if you’re in the habit of throwing your knives into the sink, the blade could easily chip. You can’t use the knife to crack through bones like you can a softer Western knife. Western knives have a symmetrical bevel, meaning they are sharpened on both sides of the blade. Japanese knives tend only to be sharp on one side of the blade. The single bevel gives it the ability to be sharper. As already mentioned, the edge on a Japanese knife is often 15-degrees of less, while the Western style rarely goes below an 18-degree edge. These days it’s become easier to find Japanese knifes with a dual edge, but in many cases the edges are still not symmetrical. Again, due to the hardness factor, Japanese knifes can be built thinner and lighter than their counterpart that must be thicker to be sturdy. If you want a lightweight knife that can slice through things like butter, with very little effort, the Japanese knife will suit you well. Western knives tend to be heavier and bulkier. The knife weight lends itself to the cutting process, where as the Japanese knife doesn’t require as much pressure to cut. 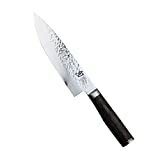 For the typical home cook, a stainless steel Japanese knife is recommended over a carbon steel knife. Carbon steel has a tendency to rust when they aren’t throughly dried, or if food is left on them. For this reason, carbon steel knifes require a lot more care and vigilance than stainless steel. Of course, if you have no problem keeping your knives clean and dry all the time, there are benefits to carbon steel, such as staying sharp longer. Both of these materials are better than ceramic knives, which can’t really be sharpened. Cost may or may not be a factor for you, depending on how much you are willing to spend. Japanese chef’s knives cost on average $150. You can find ones that are less and more, obviously. But if you’re willing to spend around $150, you can find a very nice, high-end Japanese chef’s knife that will last for a very long time. An 8-to 8.5-inch chef’s knife is the typical and most preferred size for every day tasks in the kitchen, but you may find other lengths available too. How do you choose which is right for you? I think you have to try them out to be sure which one you like best. If you have smaller hands, you might prefer a smaller blade. You can’t really know until you try it. But it’s recommended to start out with an 8-inch blade. The tang refers to the way the blade is attached to the handle. You’ll hear this said as either full tang or push tang. A full tang means the knife blade runs the full length of the handle. This can sometimes indicate better quality because it’s possible that the blade may come lose from the handle on a knife with a push tang, but when considering higher-end knives, it’s likely not going to be a concern, just personal preference. In Japanese knives, it’s not as important to consider the tang of a knife, because it is crafted differently, with the blade and the handle being two pieces that are welded together. The handles of Japanese knives are often made of wood which won’t become slippery when wet, as many of the Western knives with plastic fitted handles will. The wood is fine-grained and porous to hold its shape and improve grip. The general shapes are chestnut (frequently called “D”) and octagon, with a tapering to be slightly larger at the tail end. Cladding refers to a knife that has been wrapped. For instance, the core of the knife is carbon steel, which has been wrapped in another metal like stainless steel. These are easier to take care of than a full carbon steel knife. Many Japanese knives are clad in a style called Damascus (or Suminagashi), which adds a swirl design to the outside of the knife. The cladding doesn’t necessarily offer any benefit, but you do want to be aware of the layers and the type of steel used. As mentioned above, many Japanese knives now come with dual edges, though not necessarily symmetrical. This will be an issue for left-handed people. You’ll want to check the edge in this case, to be sure that the cutting edge faces the right directly for you. If you’d rather have a single-edged knife, you will also need to take care to look for this specifically on the knives you’re considering. A Japanese chefs knife should be made in Japan, right? Most of them are, but some are not. Of course if you’re buying the knife in Japan, you shouldn’t need to worry about this. But if you’re buying a knife online, you should check to make sure. Some are made with Japanese materials that have been imported into another country (like China) to be made cheaper. Want Japan quality? Then buy only Japanese knives. If you have a chance to travel to Japan to look for a knife, that’s the best possible way to find one that fits you. I had the opportunity to look at knives in Tokyo in Tsukiji Market and when I saw “the knife” I knew it was the one for me instantly. Even if you don’t believe in kismet with a knife, you will have a chance to talk to the shop owner about the knife, tell them exactly what you want (now that you’ve learned everything about Japanese knives!) and they can help you make a wise purchase. There are knife shops all over Japan, but of course it will be easiest to find them in the major cities – Tokyo, Osaka, Kyoto. One particular shop I like in Tokyo is Kamata. They have both hand-made and factory-made knives to suit all budgets, and they’re beautiful. You can stop by the store if you’re in Tokyo, or you can even order online and have the knives shipped to you. Tsukiji Masamoto is another option in Tokyo, if you’re already going to be in Tsukiji Market. In Osaka, you can find a really fantastic selection of knives at Tower Knives (easy to get to by train), they are open from 10am-6pm and regularly receive foreign guests, so no need to worry about a language barrier. Osaka is known as the kitchen capital of Japan. There is a whole street devoted to kitchen and restaurant supplies, called Sennichimae Doguyasuji Shopping Street. If you can’t find a knife there, you aren’t looking very hard. In Kyoto, the best place for tourists to find knives is in Nishiki Market: plus, it’s really fun to walk around. There’s a store there called Aritsugu. There are more than 400 knives on display there, so even if you’re not in the market for a knife, it’s a really cool place to explore. If you’re thinking about planning a Japan trip, but don’t know where to start, we recommend thinking about a guided tour. The company Japan and More offers a fully escorted 8-day Intro to Japan Tour that’s perfect for experiencing the best of Japan. The itinerary covers Tokyo, Osaka, Kyoto, and Nagoya, plus the mountain village of Takayama. The cost of the tour includes all accommodations, transportation, entrance fees, some meals, and pre-departure help and advice. The tour group is small, at just 8 people, so you won’t feel like you’re stuck on a bus or anything. They actually have three different tours that depart throughout the year. Going to Japan on a guided tour is beneficial because the guides can help you navigate the world of Japanese knives and find the right places to buy where you won’t be taken advantage of as a tourist. You may also want to read our guide on taking a cooking vacation in Japan. It would be great if everyone could go to Japan to pick out their favorite chef’s knife for themselves, but that’s not very practical. Instead, we have to find good options at home that we can trust. Below are a few of our favorite Japanese chef knifes that are available to purchase from the comfort of home – no flight necessary. The Shun Premier Chef’s Knife is a really good place to start. If this is your first Japanese chef’s knife, and you don’t have the time or want to put in too much time researching the options, then you can make a safe bet on this knife. It’s a good all-purpose knife for chopping, slicing and dicing. The knife has an 8-inch blade and a slightly contoured Pakkawood handle in a walnut finish that is NSF certified. The handle is symmetrical so it can be used by either a right-handed or left-handed person. is also a great buy for Shun fans who don’t want to pay quite this high of a price. The Yoshihiro Chef’s Knife is a very nice looking knife. It has a VG-10 stainless steel core clad with 16 layers of hammered Damascus steel. It is a full tang blade encased in a mahogany wood handle. The curved blade makes it great for chopping and cutting with a rocking motion. This knife has a 15-degree blade that is standard for most Japanese-style knives. This knife is not mass produced in a factory, like others are. It is 100% handcrafted in Japan. One of the things I like the most about Yoshihiro is that it also comes in a 7-inch version, in case you want a smaller blade, or have smaller hands. Out of these four Japanese Chef Knives, the Koto brand knife is the only one that is not made in Japan. It is made in China with Japanese materials, which helps bring the price down, but doesn’t necessarily mean that it’s of lessor quality. The Koto knife is a very good quality knife, especially for the price, and is a good alternative if you can’t afford the pricier options. 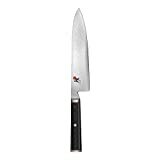 The knife is made with VG-10 Super Steel and is clad with 67 layers of high carbon steel, which has been imported from Japan. It has a Damascus pattern. The handle is made with black Pakkawood and has a slight curve to give a better grip. The blade has an 8 to 12-degree edge and it is full tang. The Miyabi Kaizen is crafted from VG10 super steel with a 64-layer flower Damascus pattern and was handmade in Seki, Japan. Miyabi’s process is to put the blades through an ice-hardening process that improves the strength and flexibility of the blade and makes it corrosion resistant. The edges are then hand-finished using the three-step honbazuke blade-honing technique that is supposed to give it a longer lasting edge. The edge has a 9 to 12 degree angle. The handle of the Miyabi Kaizen is made of a durable black linen Micarta in a D-shape that has a slight pattern on it to improve the grip. The Miyabi knives come with a lifetime guarantee and should last for a very long time if properly cared for. There is a lot of information you need to make a smart decision on which Japanese chefs knives to buy, but now that you’ve read through our guide, you should be able to make a much more informed decision. We hope you end up with a great knife that will last you a lifetime! If you’re looking to stock your kitchen with better, higher-quality knives, we have a whole guide on how to fill your knife block. Ceramic knives can be sharpened but only with a diamond sharpening plate. An Edge Pro, or other clone fixed angle sharpener can be used with a wide assortment of stones and diamond plates. Thanks Pia. We have an article all about sharpening ceramic knives too! How did you manage to write this without mentioning Seki ?